Approximate dimensions: 11'8" x 19'4"
This Canopy Tarp by King Canopy is part of their silver line of covers, tarps, sidewalls and endwalls. Designed to be used as a replacement tarp, this tarp fits the 10 ft x 20 ft canopy shelters. Built to last, these canopy shelter tops provide excellent coverage and protection from the wind and sun as wells as inclement weather. These King Canopy shelters are ideal for storing your car or truck as well as lawn equipment, boats or other machinery. Does the King Canopy Silver Replacement Tarp have holes around the edges to tie it down? Yes. This cover has grommets are approximately 18 to 19 inches apart that you attach the frame using bungee straps. What is the weight of this item? Warranty? The weight is 180 grams per square meter and it is are warranted to be free from defects in material and workmanship for a period of 1-year. Does this canopy come with the frame or is it just the top? What is the thickness of this canopy? Thank you for your inquiry. The thickness for the King Canopy Silver Replacement Tarp - For 10' x 20' Canopies is 11 MIL. 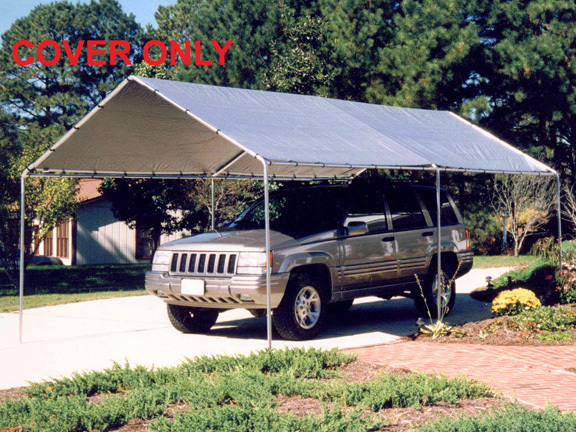 Does the King Canopy silver replacement tarp for the 10x20 canopies have grommets every 24"? The grommets are approximately 18 to 19 inches apart. Yes, the canopy is identical to the one that came with my original unit. That being said I've only replaced it once but have purchased 4 of the canopies. I use them on my farm for everything. They are a great buy and the highest quality tarp of this nature that I've seen for the price. Is the top the same as the original top that comes with kit? Yes, thank goodness! The 10'x20' standard tarp is too small and the 12'x20' is too large. This tarp is the original size. Can this canopy stand up to the heat of the sun during a summer? Or does it brittle over time? Has it been tested? This replacement canopy has not been tested as the varied conditions found in various areas of the country can be dramatically different. We have never had a complaint about them becoming brittle. The warranty for the cover is a 1 year manufacturer's warranty against defects. This would not cover any weather related problems. Does this canopy top come with elastic straps to connect it to the frame? This is the top only. The Pack of Fifty King Canopy Black Elastic Ball Snuggers are sold separately. Is this 10 x 20 replacement cover waterproof? If it's not - do you have a canopy this size that is? This cover is indeed waterproof. The finished size of the tarp was short, making it hard to install the first time. The weight of the material was far lighter than I expected and much lighter than the original tarp by almost two pounds. The corner gussets and eyelets are flimsier than the original as well. In short, what I bought is a tarp, not an awning cover. I bought a tarp similar to this one from Harbor Freight for half the price, This was not what I thought I was buying and had I not needed to use it right away, would have returned it. ProsShipped on time, well packaged. I have had this 10x20 for just over 2 years, it has held up well the top (Roof) tarp is just now starting to rip at the metal grommets on the side that get the sun most of the day. I have the silver tarp, may try white for replacement.